Days come and go and I often say to myself, "Self, this is a great idea! You should share it!" And then I either get too busy, too lazy, or forget all together. 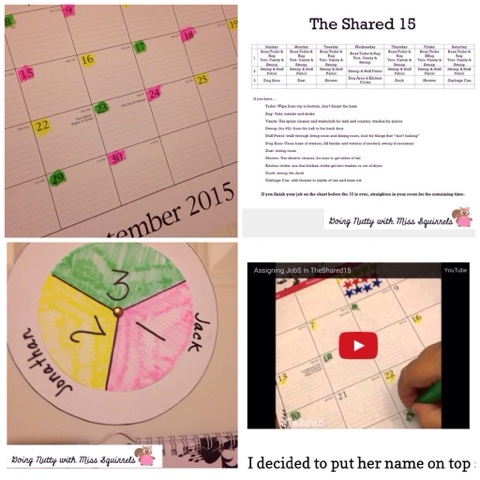 This great idea to change our Shared 15 happened almost three months ago- maybe longer - and I wanted to share it. I did on Periscope. (thank goodness those disappear in 24 hours!! I shudder to think that it would last forever). IMMEDIATELY following dinner (before the dishes are done) everyone has to devote a SOLID 15 minutes to a SHARED LIVING SPACE. The living room, bathroom, dining room, hall, stairs. Anywhere that we all SHARE. This keeps everything so tidy and makes it really nice when the kitchen is finished and we can all relax. To make it a little easier to remember and to be fair (so no one gets stuck with the toilet all the time, there is a rotation ). Everyone gives 15 minutes a day- and there are 5 of us- so that's 75 minutes of work EVERYDAY. That's - hold on let me get my calculator- 525 mins a week - which is the same as almost 9 hours of cleaning a week!!! AMAZING! 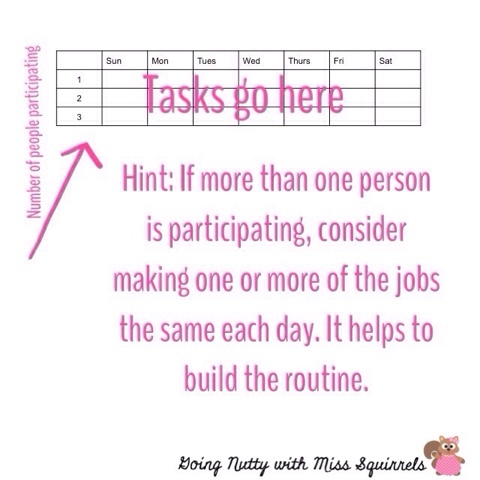 Now, for setting up the chart of jobs and how you will assign them. What type of job you add is obviously going to depend on the age of the children involved. Mine ranged from 10-17 when we started this. Because of the way it rotates, you have to keep in mind that the job the 17 year old did, will also have to be done by the 10 year old in a couple of days. So you'll have to find a happy medium. You get the idea- things that are out in the open where we all spend time together. I made a simple table with days of the week for columns and a row for how many jobs a day will get done. .
After we figured out what needed to be done daily and what could be done just once or twice a week, I filled in our chart. I also wrote a small description about expectations for each job. After I got our chart filled out I had to figure out how to decide who did what on which night. At first I was writing their initials and the number of the job on EVERY block in the calendar- that was pretty time consuming- worth it- but time consuming nonetheless. I got tired of writing it in at the beginning of the month- it was a pain and I would confuse myself sometimes! So I started playing around with this spinner/slide idea. I thought if they could see the number on the spinner, all they had to do was find the number and the day of the week on the chart and match them up! Easy peasy! You will want to divide your smaller circle into as many parts as you have people participating. Two people= draw a line down the middle. Three people= divide into thirds (which is NOT easy). I had so many failed attempts at this, that at one point I thought it would just be easier to add another kid! NOT! Now that your circle is divided, write your numbers in. 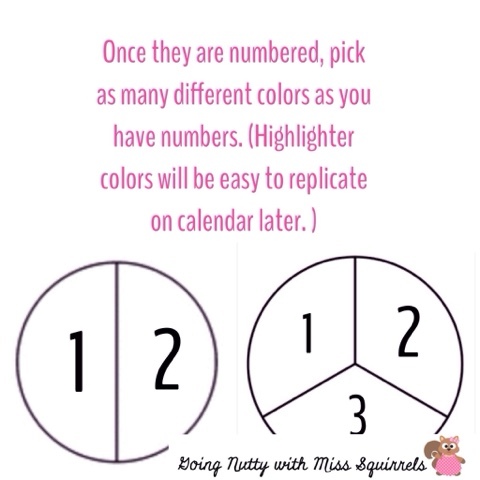 After you have it colored, put the larger circle underneath to guide you so that you can write the names of the those participating in The Shared 15. 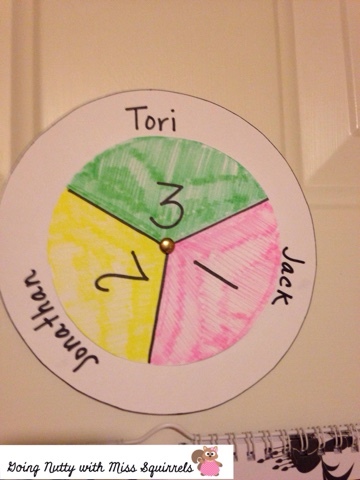 We have three names, so I just wrote them towards the middle of each section of color (on the larger circle). Then attach them to each other with the brad. This spinner stays above the calendar and job chart on the garage door. I decided to put her name on top since she is the oldest . Her name is also the marker for what the day is on the calendar. So really, whatever color the day is on the calendar is her job that day. For instance, the 8th this month is green - so I turn the spinner to green under her name. That means she has job #3. The 8th is a Tuesday this month. So she takes a glance at the chart and looks for job #3 on a Tuesday- she has to wipe down the shower. All I have to do is spin to make her color and the color on the calender match. Really, that's it. After dinner on the 8th, their toilet will be cleaned, their shower will be wiped down, their bathroom will be swept, from the hall to the kitchen will be swept, and all things things that don't belong in our shared living space will go to it's respective rooms. Then they will head to their rooms to do any straightening they need done until the 15 is over. And I don't have to say anything except "Okay, let's knock out our 15". If I didn't sound like such a dork, I would make quick video- but seriously- it's super easy- list, color, spin, clean, repeat. I know for a fact that one of the things we lack the most is time. In fact, I am willing to bet that while you were reading this you thought of 6 other things that you needed to be doing! (I know I did while I was writing it). I just really love how The Shared 15 makes everyone responsible for something everyday. We all live here- it all belongs to us, so let's take care of it! I really hope this is something that some of you can use and if you do- I would love to hear about it! And if you have any questions about it- feel free to comment or email!